With summer approaching, many people’s attention begins to turn to their gardens. As well as new plants, flowers, and turf, an ever-popular way to give your garden a makeover is with its very own water feature. There’s nothing quite like the sight of fish swimming in a pond, or the gentle trickling sound from a waterfall to add the perfect ambience to any sunny afternoon in the garden. Whether you’re looking to impress your friends, or simply add an extra layer of tranquillity to your favourite relaxation spot, there’s a wealth of water features you can choose from. 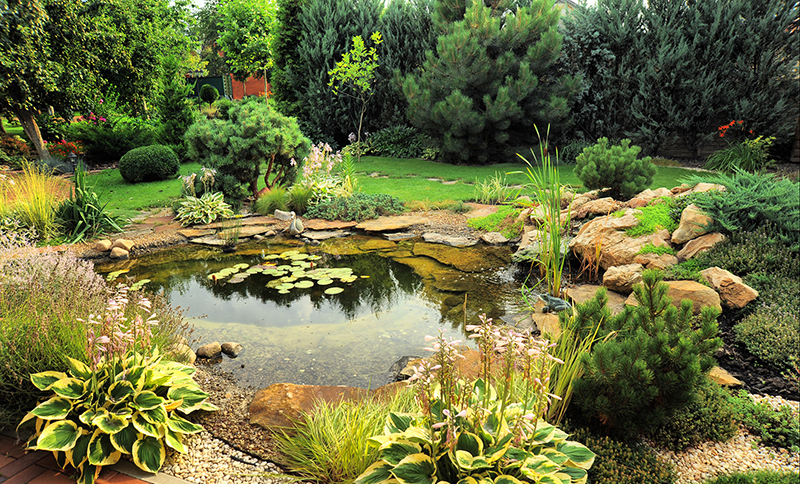 Ponds come in many types, to cater for a range of tastes and functions. One popular type is the decorative or ornamental pond, ideally situated as a central feature, or near other landscaping features which can be reflected in the water. If you’re looking to introduce wildlife into your garden, a fish pond is the ideal way to add a mini ecosystem to your property. Pond shapes can vary depending on user preference – square or circular are the general favourites – but you can also choose an irregular or undulating shape if you prefer something a little more natural looking. The key to a great water feature is to keep its size in proportion with the surrounding area. If you have a small or medium-sized garden, a pond is the perfect addition, but if you have a large amount of land with your property, a lake would be the best choice. A lake is another superb option if you wish to add fish and attract wildlife, as the added depth is perfect for nurturing nature’s visitors. If you’re considering a larger landscaping project, a lake is perfect for combining with other features, such as a rockery, extra plant life, or even a small decorative bridge, path or decking. Streams are ideal for tying together several different aspects of your garden, and are the perfect partner for ponds, lakes and waterfalls. Unlike a static pool, they also offer the ambient sound of moving water which can be incredibly relaxing. A good landscaper will be able to recommend the ideal location for your stream, as well as the best place for the pump and filtration unit in order to hide the workings from sight, and maintain a natural-looking feature. Much like ponds and lakes, you may notice wildlife arriving in the quieter sections of the water. To add a mountainous feel, why not include a waterfall, which will increase both the ambient sound and overall aesthetic. A cascading water feature is essentially a self-contained fountain, presented in either a stylised or natural-looking finish. 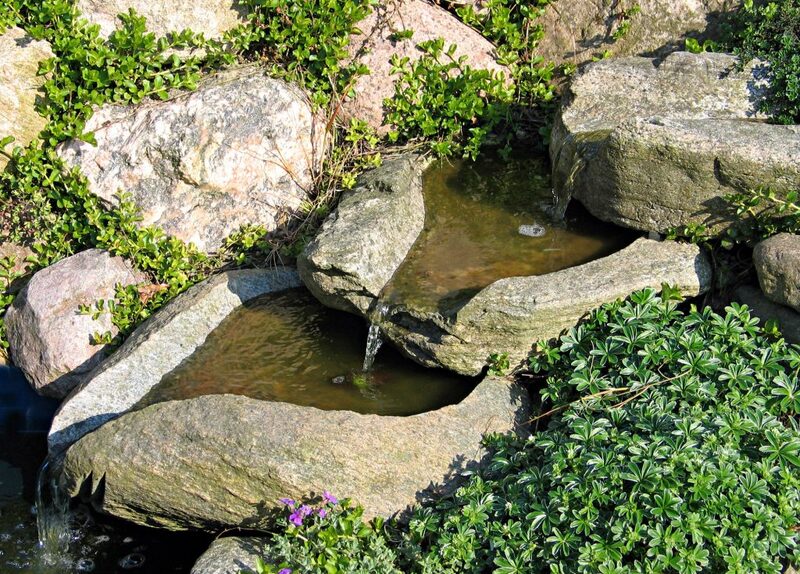 Stone or ceramic builds can be employed to give your cascading water feature an interesting or artistic look, while a rockery cascade is the perfect choice for a more rural aesthetic. A cascading water feature can also be incredibly versatile, equally well suited as a solo piece, or as part of another feature. If you have a particular idea in mind, there’s no reason why this can’t be relaised by a skilled landscaper. Here at Groby Landscapes, we offer specialist landscape designers, who’ll sit down with you to discuss and sketch out your dream garden. From water features of all shapes and sizes, to pathways, seatings, plants and trees, our Marshall’s accredited service is ready to assist. Book your appointment today to discuss options for your landscape.